A paint ball birthday party is an exciting and unique experience that everyone is sure to love and remember for a long time. There are many places that offer this type of party. However, the best place to host is at Action Packed Paintball Games in Jordan, MN. A paint ball birthday party at Action Packed is sure to please everyone on your guest list, especially the guest of honor. This facility is open seven days a week, at any hour, for private birthday parties. The party can be for as little as 2 people and up to 150. The facility offers covered parking, dining and restroom facilities, and most fields are spectator friendly. 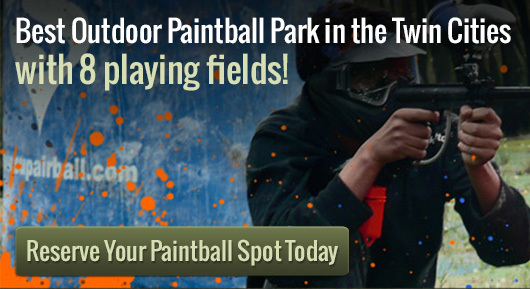 The paint ball birthday party includes rental of the facility and the use of as many fields as requested. Players are also equipped with the necessary gear to play. This includes the semi-automatic paintball gun, mask, shield, air tank, and paintballs. Upgrades are also available. These upgrades allow users to obtain more paintballs and different paintball guns. Free compressed air is also available to all players throughout the course of the party. Action Packed Paintball Games offers customers a variety of fields in which they can play on. These fields include Firebase Alpha, The City of Tombstone, The Civil War Field, The Jungle, and Woodsball Field. The equipment that is available for rent includes the best available items on the market. They are checked frequently to insure they work properly for every player’s convenience.